First and foremost, in author Tom Perchard’s words, ‘a study of [jazz’s] French creation between 1945 and 1985’ After Django also ‘investigates those critical discourses that “made” jazz into an object of fascination, debate, and contemporary culture [... and] asks how particular historical narratives of the music’s life in that country have been constructed’. Although ostensibly taking up the story roughly where Andy Fry’s Paris Blues (University of Chicago Press) leaves off, Perchard first backtracks a little to set the immediate critical/cultural scene: the internecine struggles between the traditionalists (doyen Hugues Panassié) and modernists (Charles Delaunay their chief flagwaver). This being France (the home of Barthes, Foucault, Sartre, Baudrillard et al. ), he also carefully weaves into his account what he terms ‘the theoretical work so readily identified with the French postwar’, without abandoning the book’s ‘loyalty [...] to the music made’: ‘where “ideas” are evoked, it is in the service of jazz’. Accordingly, Perchard’s study takes the stylistic progression in jazz (from traditional and swing, through bebop to free jazz) as the thread linking his seven chapters, addressing along the way such knotty issues as French identity (brought into sharp focus during the Nazi occupation, but also prominent thereafter in the theories underpinning the musical compositions of pioneering jazz writer André Hodeir); racism (whether based in primitivism, essentialism or outright hostility to ‘the Other’); and the manner in which French discourses on jazz have influenced attitudes to it worldwide, particularly respecting the tension between composed and improvised music, but also regarding the critical consensus on such figures as Thelonious Monk and Miles Davis. As well as being a carefully argued study of such weighty philosophical/sociological concerns, Perchard’s book also contains fascinating details about individual jazz lives (chiefly Barney Wilen, but also Martial Solal, Sidney Bechet etc. ); intersections between new wave French cinema and jazz; and interplay between momentous political changes (les événements of 1968, Algerian independence etc.) and the music. 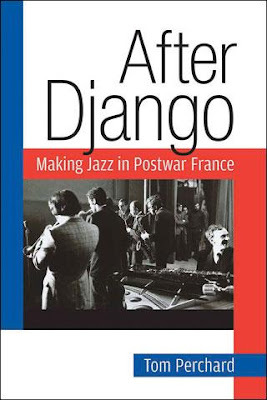 After Django in short, is essential reading for anyone interested in the process of jazz’s assimilation into French culture in particular, and into European culture in general.